Coming off of a hard-fought win over Western Washington University in the first game of the Sodexo Tip-Off Classic, the UC San Diego women’s basketball team faced off against another Washington state team, Seattle Pacific University. Having already played exceptionally since the start of the season, the Tritons kept their consistency against the Falcons. With a final score of 83–72, UCSD came home with yet another win, keeping its season perfect with an overall record of 4–0. The Tritons led the game at the end of the first quarter, but only marginally (20–18). UCSD scored the first 3 points of the game, with junior forward Mikayla Williams’s 2-pointer and free throw giving the Tritons the initial lead. Nevertheless, despite the point gap widening to 10–3 during the quarter in favor of the Tritons, the Falcons battled back, eventually taking the lead for the first time with two and a half minutes left in the quarter. The second quarter mirrored the first as both teams scored back and forth, with both teams earning 16 points apiece; the first half ended with a score of 36–34. The third period was much less auspicious for UCSD, with Seattle Pacific scoring 5 more points than the Tritons in the quarter and leading by the time the final quarter of the game started. Still, the Tritons were not to be phased, doubling the 14 points the Falcons earned in the fourth quarter with a huge gain of 28. 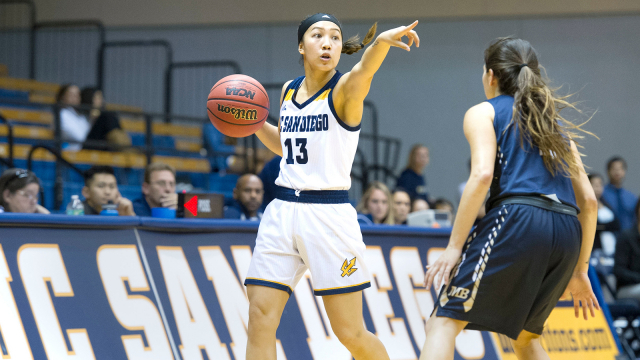 With decisive final quarter play, UCSD took the game 83–72. Offensively, on paper, the Falcons did better individually, with their lead scorer boasting more points than redshirt senior guard Joleen Yang’s 25 points. Still, the Tritons ultimately prevailed with their strong defense — junior forward Haleigh Hatfield claimed a game-high 16 rebounds — and more cohesive team play. The Tritons come home to play California State University, Chico State on Nov. 24. The game starts at 5:30 p.m. in RIMAC Arena.